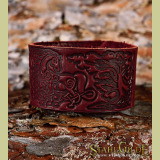 This leather Bracelet Cuff is embossed with Horses celtic knotwork design. 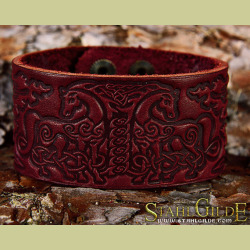 Horses are associated by the Gauls with several gods and goddesses, and were emblems of the sun. Also the Horse is associated with war. With war, comes attributes of victory, conquer, longevity as well as procurement of territory and other spoils that come with triumph in battle. Romans also believed the Horse to be a symbol of the continuity of life.